2. Cut a piece of mint green textured cardstock 14.5 x 14.5cm, mat and layer with a 14 x 14cm piece of pink backing paper and adhere to the card blank. 3. Cut another piece of mint green textured card stock 11x11cm, mat and layer with a piece of green patterned paper 10.5 x 10.5cm and fix to the card blank at a slight angle. 4. Cut a strip of paper from the Tatty Teddy backing papers and adhere to the bottom of the card. 5. Stamp the Special Mum sentiment on white card and cut out, fix with foam squares in the bottom right corner. 6. Add the decoupage topper to the centre and finish by adding the bunting. 1. Cut a piece of me to you backing paper 14.5 x 14.5cm and adhere to a Kraft card. 2. Use the First Edition largest stamp die to cut a piece of the sentiment paper, adhere at an angle to the card. 3. Cut a piece of stripe paper 14.5 x 5cm adhere to the centre of the card blank. 4. Add a length of ribbon and a bow on the left hand side. 5. Make the decoupage topper and adhere to the centre of the card. 6. Adhere the flowers to the top right corner, adding a button with jute threaded through from the bunting packet and two pearls. 7. Stamp a sentiment onto white card, mat and layer onto kraft card then adhere to the bottom right corner of the card. 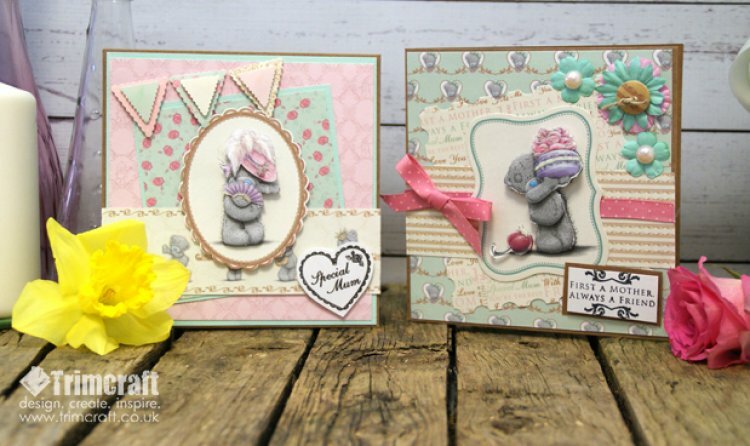 We love the sweet images in the Me to You decoupage kit and the best thing is the images are perfect for everyday crafting too! Show us your Mother’s day makes in the project gallery.